"The Japanese are presenting at 1p.m. eastern standard time today what amounts to an ultimatum. Just what the significance the hour set may have we do not know, but be on alert accordingly." Tora!Tora!Tora! is one of the most remarkable, if not quintessential war films. For me it is such a compelling work of art since it works on two very different levels, both of which I find fascinating. First off, I am a history nut, and this soothes that aspect of my nature. Tora!Tora!Tora! is at its core a meticulously accurate and even-handed account of the events leading up to the attack on Pearl Harbor, told not just from the U.S. side, but from the Japanese as well. I believe using a Japanese director, Kinji Fukasaku, for the Japanese scenes, in addition to Richard Fleischer (Dr. Doolittle, Soylent Green, Fantastic Voyage) who managed the American scenes, lends certain credibility to the film. On the other hand, not to deny the painstaking authenticity of the reenactment of the Japanese attack on Pearl Harbor, but once the Japanese war cry of "Tora!Tora!Tora!" begins the incredible 45-minute barrage, the Academy Award®-winning special effects are so wonderfully visceral, it sends ones testosterone into overdrive (for more on this see the audio portion of the review below). Yet, as a side note, with all of the destruction and mayhem, not one person is killed on-screen. It just goes to prove that you don't need blood, guts, and gore to convey the utter chaos of war. With an intentional slice, the two-minute intermission at 1h:19m:40s dissects the political battle from the actual battle. Tora!Tora!Tora! is not however, simply a rock-em, sock-em war movie. Instead, it is a tale of human pride and human frailty. These were not cookie cutter people, plastic and without emotions, these were people caught in a current without sanctuary. For instance, many in command in the Japanese Navy disagreed with hostile intentions of those in the more powerful Army, but had no choice but to execute the war as ordered by their superiors. As is usually the case in war, the best men are not necessarily the ones in charge, and have little choice in the matters at hand. They are however, the ones that execute the plans with an unmatched passion, accuracy, and selflessness. There are many truths about this historical period that surface when presented with 20/20 hindsight. So many mistakes were made on both sides before, during, and after the attack, that these mistakes seem arbitrary, so much so that in the end it is unlikely that either party could have detoured their date with destiny. The Americans seem more like the Keystone Cops, than the greatest fighting power on the planet. Whether it was grouping the planes together fearing sabotage rather than attack, or disregarding the dozens of decoded intercepts or radar readings, or not passing on to the upper brass information about the capture of a Japanese submarine at the entrance to Pearl Harbor, or simple lethargy, the Americans screwed the pooch at every opportunity to prevent the attack. On the other hand, as eluded to before, in the long run they were lucky enough to have sent out several of their aircraft carriers on short reconnaissance missions; had they not been away the ability of the Americans to regroup would have been severally hindered. The Japanese politicians let the war mongers in the Army convince them that rather than retreat from China and repair US diplomatic relations, to instead join Germany's Axis Alliance and declare war on the U.S. Despite that their main targets were the U.S. carriers, the Japanese decided to play safe and return their attack squadron back to Japan, rather than first destroy the American dry docks and second search out the aircraft carriers and destroy them as well. Perhaps the biggest mistake made by the Japanese was, due to ineffective communications, attacking Pearl Harbor 55 minutes prior to the declaration of war handed to Secretary of State Cordell Hull by Ambassador Nomura. This is the most poignant moment of the entire film, as the deep, pregnant silence between two men caught in an historic eddy is juxtaposed against the loud, bassy explosions of the attack. "I fear all that we have done is to awaken a sleeping giant and fill him with a terrible resolve." Image Transfer Review: Fox streets Tora!Tora!Tora! as the second anamorphic 2.35:1 original widescreen theatrical aspect ratio presentation on 11/2/99 along with the Thin Red Line. Finally Fox is coming around! This transfer is a mixed bag however, despite the anamorphic treatment. Although this film was not fully restored, it is extremely evident the difference modern technology can make to a film simply by comparing the final product to the original trailer included. The latter is very dark, lacking considerable contrast, or is too blue and very dirty. The transfer swings from sharp and detailed, where you can see every pockmark on Nagumo's face, to flat or soft, grainy and unfocused, to which the best example comes as the Japanese Zeros take off for the attack at dawn. The quality differs often from shot to shot, scene to scene. This leads me to believe that this may be due to the print used. For instance, during the attack on Pearl Harbor, there is evidence that a camera had either a dirt smudge or chipped lens (ch21, 1h:31m), since this appears from only one angle cut into the scene. Although there is very little pixelation (i.e., ch22, 1:35:30), there is a fair amount of aliasing distortion throughout the film. I'm a bit torn about this transfer, since despite the age of the film it is my belief this transfer could have been better despite the THX certification with some more effort on Fox's part, but it is generally very good. Audio Transfer Review: There are two THX certified English soundtracks on the disc, one being a Dolby Surround 2.0 track, and the other a strange but solid Dolby Surround 4.1 (FL, FC, FR, S , .1). I took on the latter. While Fox had near abandoned its support for anamorphic enhancement (The Thin Red Line marks the first anamorphic transfer from Fox since the extraordinary Alien Legacy set), the one thing they have done is concentrate on putting out some superb audio transfers. Because of this, I have to assume there is a reason why Fox could not manage discrete rear surround channels; an inability to separate this channel being the most likely conclusion (if I hear differently we'll update this review). Still, the front stage of this mix is dynamic and very full of bass throughout, whether during the incidental music or the deafening hum by engines of the Japanese airfleet. From the moment they start the Zeroes' engines (approx. 1h:25m), throughout the entire attack on Pearl Harbor (a near hour) there is a tremendous amount of .1 LFE contribution, and terrifically rendered sweeping effects as the Zeros swoop across the screen and attack, particularly during the dogfight (2h:09m). The rear surrounds are utilized throughout for ambient noise, and particularly for distant engine hum, gunshots, and bomb dropping. Considering the age of the film, this is a very active, powerful mix. I was very happy with the workout it gave my brand new baby, the JBL PSW-D112 12" 250 watt powered subwoofer. Shake, rattle, and roll, baby! Extras Review: There are unfortunately very few extras on this disc. The non-animated menus are among the dullest I've ever seen. Besides scene selection (31 cues), the disc also contains the original unrestored theatrical trailers for Tora!Tora!Tora!, Patton, and The Longest Day, English and Spanish subtitles and captions for the hearing impaired, as well as an additional THX certified French language mono track. Summary: I don't think Tora!Tora!Tora! could be remade and feel any more authentic, and if so, certainly for no less than a hundred million dollars. Even if it could, I'm not sure I'd want anyone to redo this classic. 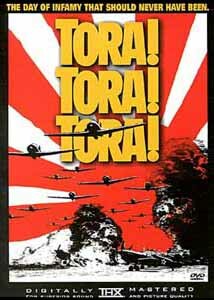 I remember laying around my parent's bed during WGN's Family Classics with Frazier Thomas (Garfield Goose) on which Tora!Tora!Tora! was played yearly. My dad would tickle me until I couldn't breathe during commercials. I know you all don't care, but that's one of the special things about films to me—a sense of youthful wonder, and a time for the family to gather in my Parent's room, where the main TV was in the house. It's fine and dandy that Fox and other studios have been ramping up their current release schedule for recent theatrical releases, but despite some great contemporary films, it is the vast amounts of catalogue titles that retain true sentimental value for many of us. Despite the time, effort, and overhead that each studio would need to restore and anamorphically enhance (where possible) their classics (if not for us, then for the love and preservation of their OWN movies), this is where I believe studios stand to make the most money on DVD in the long run. Perhaps I'm wrong—it wouldn't be the first time...just ask my fiancé. Here is yet another chance to err: although it goes against my grain, despite a good an unrestored print and lack of extras, Tora!Tora!Tora! is a must for every war movie lover's collection.